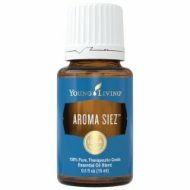 Aroma Siez Essential Oil blend is excellent for soothing muscle discomfort after exercise. A relaxing blend that is excellent for massaging away life's little discomforts. Well suited for use after exercise or at the end of a trying day, it also provides soothing comfort for the head, neck, and tired feet. It is one of the oils used during Raindrop Technique for this reason. This is an easy reference guide for Aroma Siez Essential Oil Blend. It will tell you how to use your oil blend and what to use it for. It will also provide you with some fun tips and testimonials! Want to Purchase Therapeutic Aroma Siez Essential Oil? What is in Aroma Siez Essential Oil Blend? Lavender Essential Oil (Lavandula angustifolia) can help you relax, wind down before bed and even ease stress. Its balancing properties create a relaxing and harmonizing environment. What are the Documented Uses for Aroma Siez Essential Oil? Soothing muscles after exercise. What is the Aromatic Affect on the Mind? Invigorating yet calming. What is the Spiritual Influence? Supports us in releasing tension in the mind and body. Assists us in letting go of negative memories that are stuck on a cellular level. Helps us be consistent in our work or projects. Can this oil be used for Animals? Yes, I use it on horses and dogs. For horses, I dilute about 10 to 20 drops of essential oil with an once or two of vegetable oil depending on how big the horse is. And place it along the spine, especially up on the sacrum area where the sacroiliac joint is. If you want to really spoil your horse, place a warm, moist towel over the spinal area after applying the oil! What are the Safety Precautions? Aroma Siez essential oil does not have any known contraindications. Do not use on children less than 18 months of age. Could result in skin irritation (dilution may be necessary). Place this oil directly on muscles after exercise and place a warm compress over the area for comfort.